The Barry County Republican Central Committee will host a free barbecue dinner open to the public this Friday evening, June 8, at 6 p.m. The event will feature a full course barbecue dinner and introduce the Republican candidates for the upcoming August Primary Election. 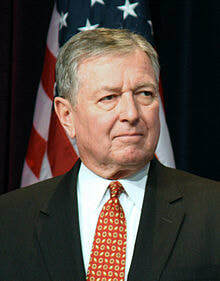 The guest speaker this year is former U.S. Attorney General John Ashcroft. Ashcroft graduated with honors from Yale University in 1964 and received a law degree from the University of Chicago in 1967. He was an associate professor on the business faculty at Southwest Missouri State University in Springfield. He and his wife, Janet, have coauthored two business law textbooks, in addition to authoring numerous professional articles. He was appointed state auditor in 1972, was elected state attorney general in 1976, and was reelected in 1980. He is a former president of the National Association of Attorneys General. He was appointed by the Reagan administration to serve on the U.S. Attorney General’s Task Force on Family Violence in 1983 and in 1986 was appointed to the Advisory Council on Intergovernmental Affairs. He has served as chair of the Education Commission of the States, the Republican Governors Association, and the National Governors Association. Ashcroft was elected governor of Missouri in 1984 and held that office until 1993. He went on to win election to the U.S. Senate where he served from 1995 to 2001. In 2000, he was named U.S. Attorney General by President George W. Bush. He resigned in 2004 and took a teaching position at Regent University. The event is free and open to the public. The dinner will be held in the Crowder College Community building in Cassville beginning at 6 p.m. on Friday, June 8.